The most important component of a good corporate training strategy is an understanding of what your organization’s needs truly are. As the leader of training and development in your company, you may have a completely different idea of where gaps exist and until you’re able to properly identify the overall training needs of your employees, you’re never going to be able to truly implement an effective strategy. 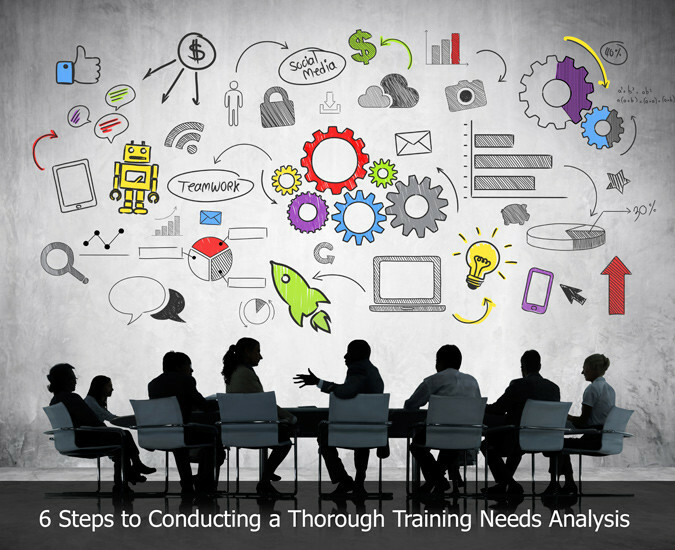 Below are six of the most important steps to include in a training needs assessment. These steps work well for organizations of any size and in any industry. After taking a look at the existence of the potential for the requirement of a Training Needs Assessment, the next step is to use your own observations and experiences to determine whether or not these gaps are truly the result of a lack of training or whether they can be attributed to something else. For example, your Training Needs Assessment may end here if you realize what appears to be a problem resulting from a lack of training is actually stemming from a lack of feedback from managers or problems in the recruiting and hiring process. After steps one and two if you’ve come to the conclusion it’s time to conduct a needs analysis of your organization’s training, you have three primary types of Training Needs Assessment to select from. These include organizational, task and personal analyses. With organizational analysis, you’re looking at how you can address gaps with the ultimate goal being the alignment of business strategies and training strategies. An organizational analysis really relies on a top-down approach and a commitment to a culture of learning. Task analysis gets more specific and is a way to gauge specific knowledge, skills, and levels of expertise. Personal analysis approaches the process of conducting a Training Needs Assessment from an individual standpoint where you look at your employees to determine whether they’re lacking in some area crucial to their ability to perform in their position. Now that you’ve looked at the needs of your organization in a large scale sense, it’s time to begin drilling down to the specifics and looking at data. At this point in your training needs assessment, you can begin issuing various evaluations, tests or assessments that will allow you to collect data that can then be used to specifically create training content. Effective training on any scale requires a set of goals and metrics that can be used to evaluate whether or not training is achieving the desired results. After assessing your organization’s holistic needs and then also looking at the specific needs of employees, it’s necessary to then create a set of goals based on the results of your assessment. Develop benchmarks that are in-line with training and corporate goals in order to then evaluate training once it’s delivered. There are so many factors that come into play during step six including the makeup of your workforce, your budget, and technological capabilities. At this point, you’ve delved into where training is needed and how goals will be defined so it’s time to plan the implementation of training. Will you offer a blended learning environment which combines eLearning and classroom training? Perhaps you’ll rely only on a learning management system or maybe a combination of eLearning and mentoring. What do think about the above steps we’ve defined in the process of conducting a training needs analysis? Would you add any steps to the process based on your experiences?